Urban Mobility and Citizen Participation in decision-making will be the two axes of the exchange of experiences between Western Athens, Greece, and Mérida, Yucatan, Meixco. 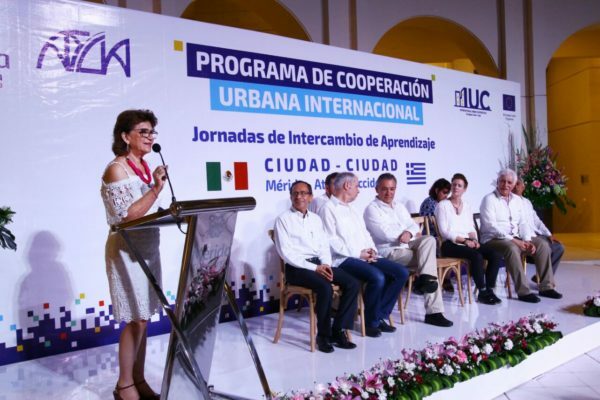 This collaboration comes as a result of the response of the Yucatecan capital to the call of the European Union to participate in the International Urban Cooperation Program. Mayor María Fritz Sierra inaugurated with her counterpart, Dimitris Birmpas, mayor of Aigaleo, Western Athens, the works of the international cooperation program “Urban mobility: planning and participation”. Mérida is interested in the Western Athens’ urban mobility planning experience and the Greek city is interested in the Merida experience in the exercise of social participation for decision making. The beginning of the cooperation work in this capital crystallizes the initiative of the mayor with the permission of Mauricio Vila to put Mérida on the international cooperation route under the protection of the European Union that promotes the exchange of knowledge and the union of forces among the major European capitals and the rest of the world to find solutions to common problems for a more prosperous and sustainable future. The mayor of Mérida Maria Fritz Sierra said that for a city to move forward and achieve great results, it is important to go hand in hand with other capital cities that gone through similar situations, in order to learn from their experience and come up with their own solution. Fritz Sierra informed that representatives of the three levels of government, businessmen, academics, non-governmental associations and collectives have agreed to work together on this issue, which is a priority for all. The mayor of Aigaleo, Western Athens, Dimitris Birmpas, stressed that the coordinated work between Mérida and the city he represents will be of great importance, especially now in times where important challenges are being faced such as climate change, scarcity of natural resources, and cooperation schemes between cities for the common good of the inhabitants. Edgardo Bolio Arceo, director of IMPLAN, informed that the works started prior to the inauguration with a meeting in which the authorities of Western Athens and Mérida presented various experiences of urban mobility planning. The City Council of Mérida exhibited the Master Plan for Sustainable Urban Mobility and the Bill of Pedestrian Rights. During the event, the mayor of Mérida and the mayor of Aigaleo, Western Athens, signed a letter of intent in which the scheme of cooperation from city to city is established.